This year I became wiser (in this one respect, at least). I'm waiting to bake until the week before Christmas so all those goodies aren't hanging around. Goodies hanging around + Kids who are already getting excited for Christmas (and therefore a little bit crazy) = A mama who wants to self-medicate with goodies. I also decided I would let Jamey and each child chose a cookie and those four choices would be the kinds I would make. Jamey chose my mom's pecan tarts. Sam chose peanut blossoms. Sadie chose sugar cookies decorated with icing and sprinkles and, as a group, we chose dipped gingerbread cookies for Miriam. I made these gingerbread cookies last year but forgot to share the recipe with you, so you'll find last year's photos and the recipe below. These cookies are soft and chewy and I love the gingerbread-chocolate combination (and the chocolate is so much easier than icing them, in my opinion). This recipe makes a lot, just so you know. You can freeze the dough wrapped tightly in saran wrap if it's too much for you at once. those are beautiful,now send all the kids over ,and do it at my house-I have not finished baking-can't persuade even the teens to do a cookie recipe and they have had home ec. These look delicious, thanks! I love a soft and chewy gingerbread cookie...need to pick up some shortening, I guess. Have you tried these with the Spectrum kind? Just wondering if they stay as soft...will have to see. Hi! Can you use butter vs. shortening? Or did you use Crisco in this recipe? Thanks! I use Crisco brand shortening. I have never used "the Spectrum kind" that I know of:-). 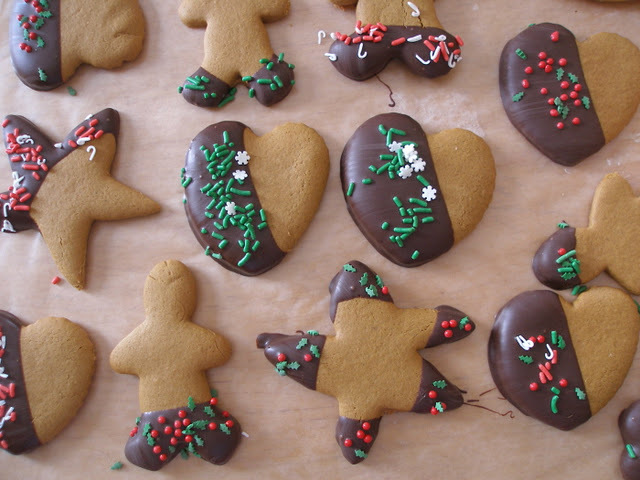 What a great idea to dip the gingerbread in chocolate! We currently live in Madagascar where it's HOT during the Christmas season. After 6 years i've finally given up on gingerbread with icing because it's a) too much work for b) a melt-all-over-the-place mess. 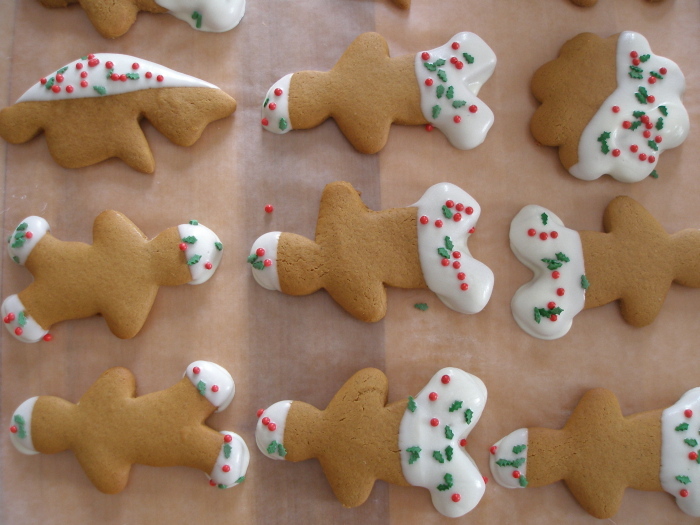 But, sigh, i yearn for the gingerbread at this time of year. I'll try the chocolate and see if it makes it any better. Thanks! Do you think this could work if I shape them into a log and slice (kind of like a biscotti?) and then dip when they're cool? Would you adjust your oven? I've never tried this but I think if you adjust the baking time for the thickness (unless you can cut them 1/4 inch think) you should be fine. I would just keep a very close eye on them in the oven- the best time to take them out is just before the start to brown around the edges (if you want them soft). If you want them with a bit more crunch (like biscotti) you could leave them in longer. You may just need to remove a couple as you are baking and check them to see if they're done to your liking. Happy baking!